I woke up in a sweat, my heart racing, with that awful, foreboding, sick feeling – something was wrong, and it was bad! I’d just woken from a dream about my friend’s impending danger. A month later that very same friend was dead at age 43. I went into a tailspin. Revisiting the dream, I wondered what could I have done differently, worse yet, what, perhaps, SHOULD I have done differently? It wasn’t just the dream itself but the sick-feeling accompanying it. I’d had it before, a number of times. Angel was familiar with “those dreams” and the feelings. We’d experienced them previously and she’d asked me to always alert her any time I had “another of those dreams” involving her. Still, I hesitated, not wanting to frighten her. Also, what if the stalking was just a metaphor, not literal? I e-mailed her anyway. She was familiar with the metaphor aspects of my dreams. I sent a nonchalant message suggesting she call me when she wanted to hear about “another one of those dreams.” I’d thought I would hear from her when she was ready, and then I could explain the entire dream and also be available for her if she wanted to discuss. But I didn’t get that opportunity. She died before we had the chance. I first learned of her death from Facebook. 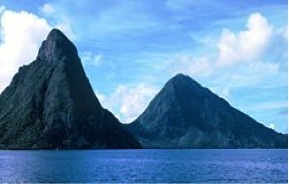 As more information became available I learned that ‘Angel’ had been on vacation in St. Lucia when she’d died. My dream had held clues. 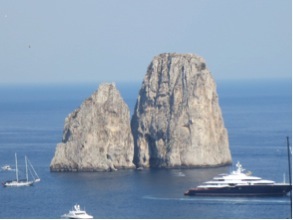 “On vacation,” – check; “vacation destination,” – check; “island,” – check; “I haven’t been there before, but it reminds me of Capri,” – check (not identical, but similar). However, with Angel’s death, there was no mention of stalking, just that she’d gotten sick, had gone into a septic coma and died. Also, my dream did not foretell her death. Still, — I couldn’t help wondering, if I had been more forthright, if I had shared the urgency and the dream, might my friend still be alive today? This wasn’t my first rodeo. I have a track record with “those dreams.” I realized I was grappling with dreamer’s guilt. Dreamers who have precognitive/psi dreams sometimes question what should be done. I’m familiar with others with warning dreams who have also wrestled with tell/don’t tell quandaries, and sometimes, dreamer’s guilt. I’ve asked a few of these dreamers to share their stories and personal reflections with you. Into waking from a dream I see someone I know with bite marks on his body. When fully awake I ask my husband if he has seen or heard from this person lately. He says, ‘no, why?’ I tell him what I saw. Later that same day I get a knock on my door. I open the door to see, standing there, the same person from my morning dream. He has blood dripping down his face from above his eye. He says, ‘Please help me!’ I say, ‘What happened?’ He tells me someone bit him. I am stunned, thinking of my into-waking dream visual. While helping him and calling someone to take him to the hospital, I am lost in wondering, how could this be? If I had called him in the morning perhaps it wouldn’t have happened, but I also wonder if it was destined to happen. What if I had called and just the timing of the call or what I said on the phone changed the timing throughout the day? Would the sequence of the day’s events have changed, and if so and it didn’t happen after all, then would anyone know if it could have? And if it didn’t happen, would it seem like the dream was not a true psi dream warning? And then would I be less likely to say something next time or people less likely to believe me when I pass along dream warnings? I can’t say, but for me, after this experience I find when I see something in a dream I usually say something to the person I feel it connected to, but also knowing that sometimes the message is not as clear all the time like this one time. Usually I will say to the person I feel the dream connects to, that I am not sure exactly who, what, when, where, why, etc., but I would rather say something and be wrong about the dream message than be right and hadn’t warned them. Another dreamer, Maria Carla Cernuto, experienced precognitive dreams predicting several family members’ health emergencies. Here are synopses of her stories. I dreamed this January 18, 2013, my dad died July 9, 2013 in the following way: seizure, stroke, and what finally killed him, a heart attack. (full story at: http://www.awakendream.com/?p=313 ). During a family get together following my father’s wake, the subject of after death communication dreams arose and then progressed into discussing predictive dreams. I shared dreams which foretold of my father’s passing and my uncle’s heart attack. My self-proclaimed atheist cousin exclaims, ‘if you ever have a dream about me I want to know about it!’ He was specifically referring to dreams I may have about his health and well-being. I call L to tell him and his wife about the heart / stroke dream, and while he seemed a little concerned, he also had a somewhat dismissive attitude, particularly since he does not believe in psychics, paranormal events and the like. Another three months passes and I am at L’s house giving tarot readings to his daughters. His wife happens to come home early and asks if I could read for her, that she had a few questions on her mind. Immediately I knew the last question was about L’s health and it did not look good. I say, “his cardiologist is missing something, I know he’s recently had a stress test, but if he doesn’t get a second opinion I am afraid he will drop dead like F” (F was his best friend who had recently died from a combination heart attack / stroke – and so had my dad). Yet another three months passes, and L’s heart goes into atrial fibrillation; his heart was seriously out of rhythm and he was having a hard time breathing. His cardiologist was out of town (Kismet! ), and it was suggested that he see one of the other associates in the practice. L’s family nagged him in an attempt to get him to see another cardiologist; he seemed resolute on staying with the doctor / medical group with whom he was familiar, however he ultimately decided to get a second opinion because of my dream and tarot reading. This was huge for L since he disregards topics of a mystical nature in favor of logic. “At times I have shared dreams which I suspected to hold precognitive information, sometimes it was met with opposition, other times derision; occasionally, I have wrestled with whether to tell the person about the dream or not, particularly with dreams that have a negative theme, being concerned I might frighten someone unnecessarily if I was mistaken. I have even struggled with relaying the assumed psi dream to my cousin … but if you ask him and his wife, it was a lifesaver. I believe if we were a culture that honored dreams, we would share our own dreams unreservedly without any apprehension over the way they would be received.” (full interview at http://www.awakendream.com/?p=311). The tell/don’t tell dilemma isn’t limited to crisis dreams. In fact, sometimes, psi dreams can be an impetus to resolve issues and relationships with friends or loved ones. Exactly 4 weeks later I ran into DD at a wake for a mutual friend; I approached her and when she saw me she fell into my arms sobbing, both of us expressing words of forgiveness. Thus the title of my dream, Freed by a Forgiving Hug, as this precognitive dream foretold she and I would make amends; it was truly healing for both of us.” Maria shared the dream content with her friend after they reconciled. More of Maria’s precognitive dreams can be found at: http://www.awakendream.com/?p=308 ). In examining my own personal beliefs about the tell/don’t tell quandaries, I anticipate that every situation will be different. We all tend to do the best we can with what we’ve got at the time, and every situation will elicit a different response. When pondering the larger framework of psi/precognitive dreaming, my philosophy is still in development. A dream-type image I currently hold in my imagination is that humans have invisible threads attached to our hearts, connecting us in a web-type structure with other humans. Humans that we hold loving feelings towards, and interests we hold close to our hearts, seem to have stronger, better-traveled threads. While one could hypothesize about the structure and the threads, I leave that analysis to scientists while I focus on the love that traverses the threads. The power, I believe, is in that love itself that forges and maintains the connections. Since we’re connected through love, I hypothesize, when something is happening with our connection, in a sense, it’s also happening with/to us. This could give resonance to “mother’s intuition.” Perhaps we are meant to live a connected, shared experience. Maybe we were designed to share our dreams in a way that reveals we’re living one grand, connected experience, one dream. In hindsight, when I consider my warning dream for Angel, I do not believe she would have held me responsible. In fact, even if she had known the urgency within the dream, I don’t believe it would have changed the outcome. My latest reflection concludes I had never needed forgiveness from Angel; I had needed forgiveness from myself. With subsequent dreams, contemplation, and ceremony, I was able to lovingly release the burden of self-imposed guilt, replacing it with gratitude for having had the opportunity to experience deep, meaningful relationships, relationships that expand beyond Newtonian understanding of space and time, relationships that connect us across the miles, even beyond death, connections that bind us with love, continuously, eternally. I’m grateful to the psi dreamers who allowed me to share their stories. What’s your psi dreaming story? Let’s open the discussion now by connecting with your dreams, insights, philosophies, and reflections.